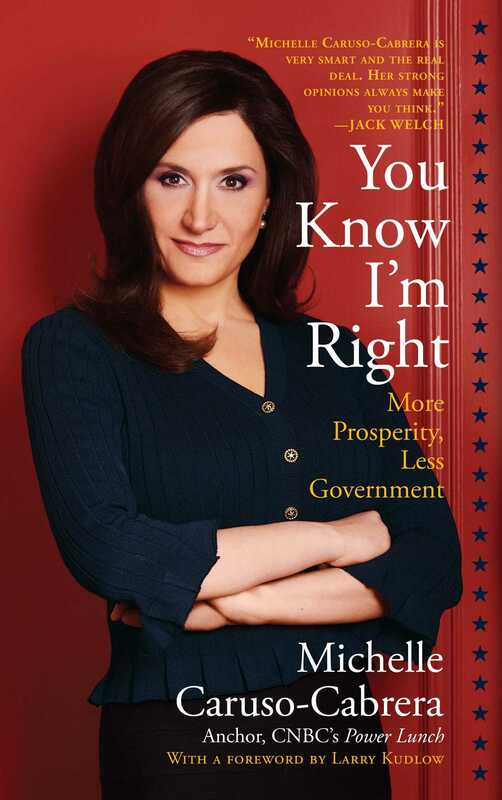 Now in paperback from straight-talking CNBC reporter Michelle Caruso-Cabrera—a modern solution to our nation’s social and economic woes involving a return to our political roots: fiscal conservatism, limited government, and personal accountability. Hypocrites and radicals on both sides of the political spectrum have left fiscally conservative, socially liberal Americans like CNBC’s Michelle Caruso-Cabrera without a party. If you tell your neighbors you’re a card-carrying Republican, they’ll assume you’re opposed to abortion, hostile to gay marriage, and don’t care about the environment or the poor. Democrats are portrayed as union-loving, tree-hugging activists, more concerned with making government big rather than effective. The reality is that both parties have been hijacked by the wrong issues and have abandoned the loyal Americans who believe that government should stay out of our private lives and out of our pocketbooks. In the smart, tell-it-like-it-is style that has made her popular with Democrats and Republicans alike, Caruso-Cabrera outlines forward-thinking free-market solutions for health care, education, and immigration. These ideas will stop our growing deficit, boost our competitive capital, and strengthen our dollar, because an economy that is flexible and free of government interference can grow faster and get the country out of its current malaise. It’s not too late to fix our nation, restore our credibility, and rebuild our political system with the tenets on which it was founded: fiscal conservatism and social liberty. Our future is counting on it. Michelle Caruso-Cabrera is an award-winning financial television journalist whose career spans 20 years. She’s interviewed the world’s most compelling newsmakers. From one of the richest men in the world -- Carlos Slim - to one of the most despised dictators - Venezuelan President Hugo Chavez. She’s covered corporate mergers and scandals and has the inside take on too many CEOs to count. Her relentless pursuit of Wall Street’s biggest stories makes her one of CNBC top presenters. She questions government interference in social policy and hammers everyone she interviews about the need for fiscal conservative. Her following includes like-minded thinkers who are educated, wealthy and powerful. Michelle can be seen everyday by finances’ biggest brokers and millions of Americans on her show -- right in the middle of the trading day. She also reports for NBC Nightly News and Telemundo. After years of experience, she has a deeply entrenched network of contacts that bring her to the center of every story that breaks on Wall Street. Her address book reads like a who’s who of business titans and she is integrated into their world, providing her intimate access. It was through these contacts she broke the story that Ezra Merkin had to resign as Chairman of GMAC because of his ties to Bernie Madoff. Michelle’s career started as a stringer for the New York Times and from there she went on to be an investigative reporter in Miami and Tampa. Michelle is a graduate of Wellesley College where she received a degree in economics.